Are you living in Brighton & Hove, in the historic county of Sussex and looking for high quality lighting installation services for your residential, commercial and industrial properties at competitive prices? If so, then Electrics on Tap is the right place for you. As a fast-growing, professional electrical company in Brighton & Hove, Electrics on Tap are highly capable of tailoring a complete electrical service that is personalised to our individual customer needs and preferences. 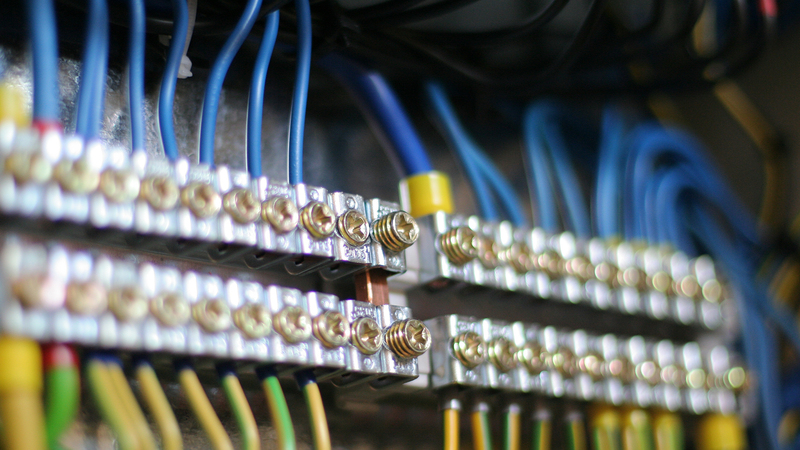 From major works such as electrical installations, electrical inspections, full house rewiring, fuse board repairs, to minor works that include heating systems, lighting, TV/phone/socket wiring, outdoor lighting and electric shower installations and more, we will provide the solution for any electrical problem at the most affordable rates. A lot of homes are unsafe and left exposed to risks and dangers, because they are unprotected. One of the easiest ways to improve the security of your home or property is to install security lights. They are easy to install and even easier to maintain. This ease of installation and maintenance is why many people choose to have them. Electrics on Tap can fix all your security lighting needs for your home or property. We are NICEIC registered and have over 50 cumulative years of experience in our portfolio. Our security lighting services range from repairing or replacing existing lights fittings to installing new lights, complete with sensors. Even if you need the services of a skilled technician to check the quality of your existing security lights, we have it covered. No task is or too big or small for Electrics on Tap. Not just electrical professionals, we also ensure to make our prices competitive. Our rates are highly affordable, no matter what you need fixed or installed. Our guarantee is that every one of our customers and clients will always be satisfied with our work, no matter the size of their budget. We will also help you with the installation of LED flood lighting for your driveways, sensor lights for your garages and gardens, and PIR lighting for automatic detection. From single stand-alone lights to multi-light systems, whatever security lighting you need for your home or property, Electrics on Tap is just the company for you. If you’re living in Brighton & Hove, you’ll know how common it is to find many buildings with security lighting. As the name implies, security lights are lights installed strictly for security purposes. They are usually different from regular household, emergency or other kinds of lighting. They’re brighter and feature unique parts that are not as easily replaced. Security lights illuminate a much wider area than normal lighting and act as a means of warding off unwanted guests or intruders. Security lighting ensures your outdoor space is well lit, making it possible for you to see your surroundings even in the dark. They don’t need to be used separately and can be integrated into security systems, such as Intruder Alarm Systems or CCTV. Why Choose Electrics on Tap? At Electrics on Tap, we’re confident in the work we do. Our goal is to provide a high quality, unquestionable, transparent and trustworthy service for electric installations, maintenance and repairs to our customers and clients. Our services are accredited by NICEIC, making us registered subcontractors in Brighton. We are also Check a Trade certified and recommended installers of the Worcester Beach Group. 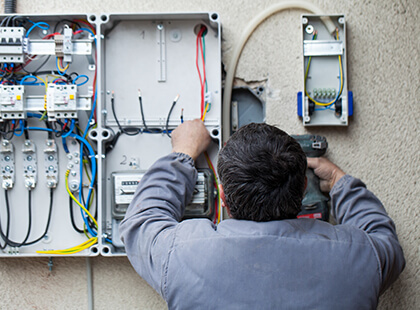 The entire installation team at Electrics on Tap have a combined experience of over 50 years, which makes us more than qualified to handle all domestic, commercial and industrial electrical installation problems that may arise. Our qualified team of technicians have worked with many clients over the years, giving them the necessary skills to handle any kind of problem. Security lights are not as common as regular household lights. As a result, it may not be so easy to find a replacement bulb, sensor, lamp or tube. It’s also dangerous for a novice to try and access the security light by themselves. This is where we come in.Don’t hesitate to call us whenever you’re in need of our services. No matter what your needs, we are more than able to meet them. One of our skilled and highly efficient technicians or engineers will discuss and help proffer a solution to your electrical problem.We can also help you lawfully dispose of your damaged light parts, as we err on the side of environmentally conscious. We are a fully insured company and our customer service is like no other. We are truly dedicated to our customers and their satisfaction is of the utmost importance. We understand the importance of customer-client relationships. When our clients are happy, so are we. We take great pride in the relationships we forge with them – relationships based on trust, integrity, efficiency, professionalism and friendliness. How do Electrics on Tap work? 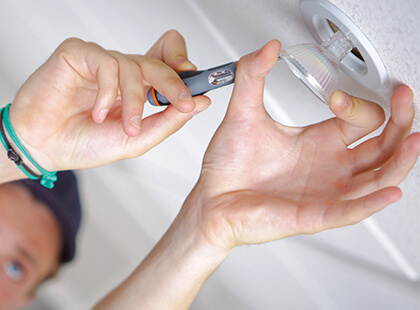 Electrics on Tap offer a range of security lighting services. Whatever your lighting needs, give us a call and one of our experienced technicians or engineers will speak with you. They will arrange to carry out a survey or inspection of your home or property where necessary, after which an assessment and a no-charge quotation will be made. Should you decide to go ahead with the service, a design proposal will be compiled, that takes into consideration your security and budget.